The visual below shows how these styles compare to Covey's six paradigms of human interaction. 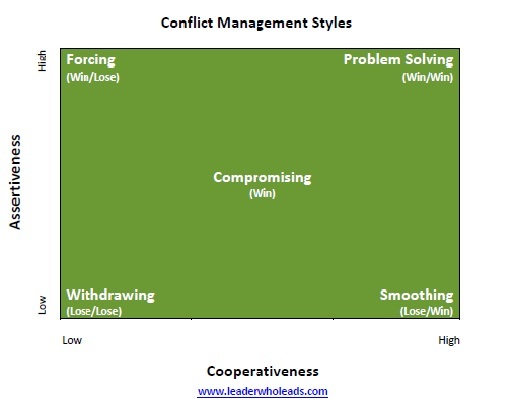 These styles of conflict management are measured along two dimensions: Assertiveness and Cooperativeness. Assertiveness relates to one's concern for their own interests. Cooperativeness relates to one's concern for the other's interests, or the interests of the person with whom they are dealing. These styles are compared to Stephen R. Covey's Paradigms of Human Interaction. The person who uses this style is very high on asserting their needs and taking care of their interests and concerns, without regard for the person or persons sitting across the table. At this extreme, it is "Aggressiveness" and destroys any hopes of a good working relationship. Forcing compares to Covey's paradigm of "Win/Lose," which says the way I win is for me to get my way and you lose. At the other extreme from Forcing, is Smoothing. The person with this conflict management style is so cooperative they will give away everything, especially to the person who is so assertively demanding their way. This person with this style usually compromises to the point that they lose their "voice" and will not assert themselves. I liken this style to Covey's paradigm of "Lose/Win." This person avoids conflict altogether. They do not assert their desires, neither do they listen to the desires of the other person. They simply refuse to talk. I liken this style to "Lose/Lose." Compromising is a blend of both assertiveness and cooperativeness. The person wants to "Win" but is not necessarily interested in the other person losing. They mean no harm to the other person, but they are not interested in helping the other person make their case. It is a much better choice than either of the three mentioned above. It takes into consideration the interests of both parties, but produces inferior results when compared to the next style: Problem Solving. Problem solving takes time, but it is time well spent. The person with this style takes into account the interests of both parties and seeks what is in the best interest of all concerned. The person with this style is willing to "drop the rock." In my estimation, it is akin to what Stephen Covey describes as "Win/Win" and "Win/Win or No Deal" paradigms. This style requires that a person is concerned about their interests AND the interests of the other person. As Covey states, "Win/Win is a belief in the Third Alternative. It's not your way or my way, it's a better way, a higher way." Indeed, problem solving is "a better way, a higher way" when approaching conflict between two parties who must work together to achieve maximum success. For more, see Conflict Management Styles and Managing Conflict.